Photo by Angelina Hekking. This photo is the cover photograph on Angelina Hekking's photography book, Seeds of Light, Images of Healing, in which she tells the story of her struggle to live an independent life with MS. The book is available for $20 from Angel Publishing,1563 Mason St., San Francisco, CA 94133. For those of us who are limited in the use of our physical capacities, daily life can be a real challenge. Although society has progressed from the time of President Franklin D. Roosevelt when he would rarely be seen photographed in his wheelchair, there is still a stigma attached to any kind of disability. For that reason, it has taken decades of hard work by people with disabilities and compassionate others to push through legislation designed to prevent discrimination in the public arena as well as the workplace. One such pioneer was Daisho Miyagawa, who was challenged with osteomyelitis most of his life. He lobbied the California legislature in the late '50s and '60s for elimination of barriers and integration of the handicapped. 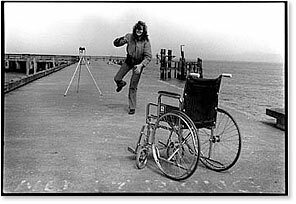 As he so aptly wrote in San Francisco, "Try climbing Nob Hill in a wheelchair." In 1977, Arlene Wong was involved in an automobile accident that activated multiple sclerosis. From her wheelchair, she co-founded the Paratransit Coordinating Council of San Francisco and, starting with a budget of $15,000, was able to get vans for wheelchair users. She has continually waged a struggle for funding, elevating the budget to its current $8.5 million. On February 1, ramped taxis will become available in San Francisco to augment existing lift vans. Last year the Executive Director of the President's Committee on Employment of People with Disabilities, was denied boarding on one of the largest airlines in one of the nation's largest airports. Rick Douglas was told he wouldn't be allowed to board United's commuter flight from Washington, D.C. to Allentown, Pennsylvania unless he could walk up the stairs unassisted. He literally crawled up the stairs on his backside (he has multiple sclerosis and cannot walk), so that he could take the flight to give a speech on the Americans with Disabilities Act, the law that created a national disability policy. Because of the enormous outcry at this injustice, the airline's rules have been changed. Joanne Cosenza. Photo by Nic Paget-Clarke. In spite of the tremendous efforts and relentless spirit of people like Daisho, Arlene and Rick, it is still a continual uphill battle for the 43 million Americans with disabilities. Fundraising efforts by many organizations such as the Muscular Dystrophy Foundation, the Multiple Sclerosis Society and others have become mainstream businesses run by CEOs making huge salaries and, although a great deal of money goes into the causes and research of mobility diseases, very little actually reaches the individuals most in need of services. People wait in vain for the miracle cure that the doctors are sure they will find soon, but in the meantime many lives are wasted because the resources necessary for attaining goals are out of reach. Fortunately, through networking and the expansion of computer bulletin boards and community support groups, the momentum is growing for an activist grassroots disability-rights movement. There are also some individuals who have managed to transcend their physical challenges by redirecting their energies. I first met Angelina Hekking when I heard she was teaching Karate to people with disabilities - she has had multiple sclerosis since age 21 and, after many discouraging years found that she could improve her walking by doing another form of martial arts, Tai Chi. She is a great inspiration, as well as an accomplished photographer and teacher. The accompanying photograph is from her book, "Seeds of Light, Images of Healing," an autobiographical book of self portraits. There are endless possibilities for people with disabilities as long as we can clear the obstacles from our paths. In Angelina's words, "I want to do it all!" Published in In Motion Magazine October 21, 1995.